If something goes wrong (and it always does) never let 'em see you sweat. So the turkey burns, or red wine is spilt on the couch or the cat launches a lugee on the dance floor when everyone's rockin around the Christmas tree. Know that a gracious host stays calm under pressure. It's the most festive time of year and many of us mark it with, well, festivities. After years of working in the hospitality trade and throwing parties for others, as well as hosting our own events throughout the year, we've figured out how to host a party that will leave everyone talking. Unfortunately, if you want to be the host with the most, you'll need to do a bit of planning. But because we're feeling more nice than naughty, we thought we'd share our top 10 rules to make your parties the most coveted invite in town. 1. Timing is everything. You should always give yourself -- and your guests -- ample notice of any soiree you want to throw. 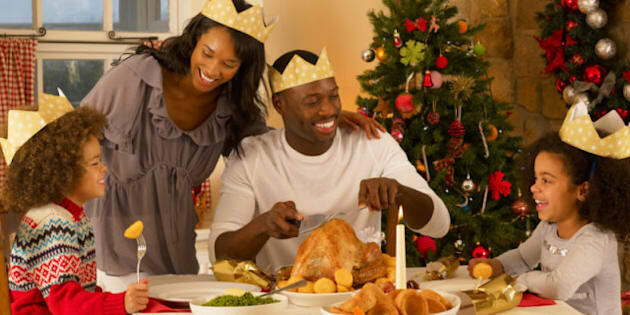 We suggest a minimum of two weeks for a casual get-together, but for more popular occasions like Christmas or a long weekend, make sure you get out invites at least a month in advance. 2. K.I.S.S. -- at least with the menu. Pick one or two star items that will require your special touch, but after that buy, buy, buy! Seriously, no one's going to care if the apple strudel is your Great Aunt Ute's prized recipe, or if you nabbed it from the European bakery on your way home from work. They will care however, if you're sweating it out in the kitchen for hours while they're left to awkwardly entertain themselves in the living room without a host. 3. Plan, plan, plan... and then plan some more. This is the golden rule to throwing a successful -- and stress-free -- party. Start thinking of the big day and how you want it to go. After you've got that image in your mind, write down everything you're going to need to make it that way: from menus to decor, get it on paper and then create a plan of attack. 4. Plan of Attack. We've endured party nightmares when we've run out of serving platters, or been short by one wine glass. We've learned the hard way -- with a plan of attack, you won't have to. Schedule. Give yourself a week to get your stuff together. Start the decorating a week out, buy groceries that won't spoil three to five days ahead of time, start cooking or baking items that will keep in the fridge or freezer for a day or two, and set the table and bar the night before. There will be a few items that will need to be done the day of (like picking up fresh bread), but keep those tasks as light as possible. 5. It's a party -- not a bar. Offer one white wine, one red, beer and one or two liquors plus non-alcoholic options. Vodka and whiskey strike us as the most popular spirits, but you can base your selection based on your guests. For mixes and non-alcoholic drinks, have sparkling water or soda, cola, diet cola, tonic water and cranberry juice. Don't forget garnish: lemons, limes, and olives. If you'd like to get fancy you can offer oranges, cherries, and cocktail onions as well. Half a bottle of wine per person (if you have 20 people coming over, you will need 10 bottles. It's our experience people tend to favour red over white, so we would buy seven bottles of red, and three bottles of white. Your crowd may be different). Three to four mixed drinks per person (a 750 mL bottle of alcohol will give about 26 single-shot mixed drinks). One bag of ice per five people (this will take care of drinks and ice buckets). Six to eight hors d'oeuvres per person for cocktail party that occurs over a meal period, but no formal meal is served. Two to three hors d'oeuvres per person for a cocktail party taking place outside of meal times, or to start off a dinner party. 7. Out of sight -- but not out of mind. The devil is always in the details so don't forget about the unmentionables. Stock up on toilette paper and leave it in a nice basket in the bathroom in plain sight and burn scented candles in the powder room to keep it fresh. Decide on a smoking area. If it's outside, leave a nice galvanized steel bucket or terra cotta pot filled with sand for butts. If it's inside, make sure there are plenty of ashtrays available. Clear room in your coat closet for coats and space in your hall for boots and shoes. 8. On the ready. Plan to be dressed, have candles lit, food and drink set out and music playing at least 30 minutes before the party's scheduled to start. Relax, have a drink and be ready -- not harried -- when the first guests arrive. 9. It's a dirty job... but you've gotta do it. During the party, take a few minutes every hour or so to go through the house to tidy up debris, ensure ice buckets are full, empty ashtrays, and make sure the restroom has clean hand towels and is fresh. Remember, the key to a good party is that the host is having just as good a time as the guests, and with a little preplanning it's a sure bet you will.